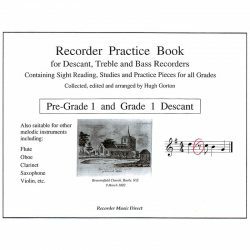 This section of the book consists of 26 very easy tunes for Descant Recorder intended to ease the beginner into the art of Recorder Playing. Suggestions on how to sight read are given in the Introduction. With the exception of the last piece, all tunes use only crotchets and minims. The note range is Low D to D with F sharp but not F natural – 8 notes in total. Most pieces are in the key of G but one is in C. Most tunes are in two/four time but one is in three/four. (The last piece contains a pair of quavers intended to prepare the player for Grade 1). Sample pages from this book are shown above. The note range for Grade 1 Descant is Low C to High E (10 notes) and uses both F sharp and F natural. C sharp and G sharp are also introduced. In addition to crotchets and minims, found in Pre-Grade 1, dotted minims and quavers are added, along with their rests. The keys are C and G major, and A minor. The time signatures are two/four, three/four, four/four and ‘common’ time. One piece is in three/eight. The last piece in the book contains four semiquavers. Altogether there are 90 pieces of music in the book. Sample pages from this book are shown above. 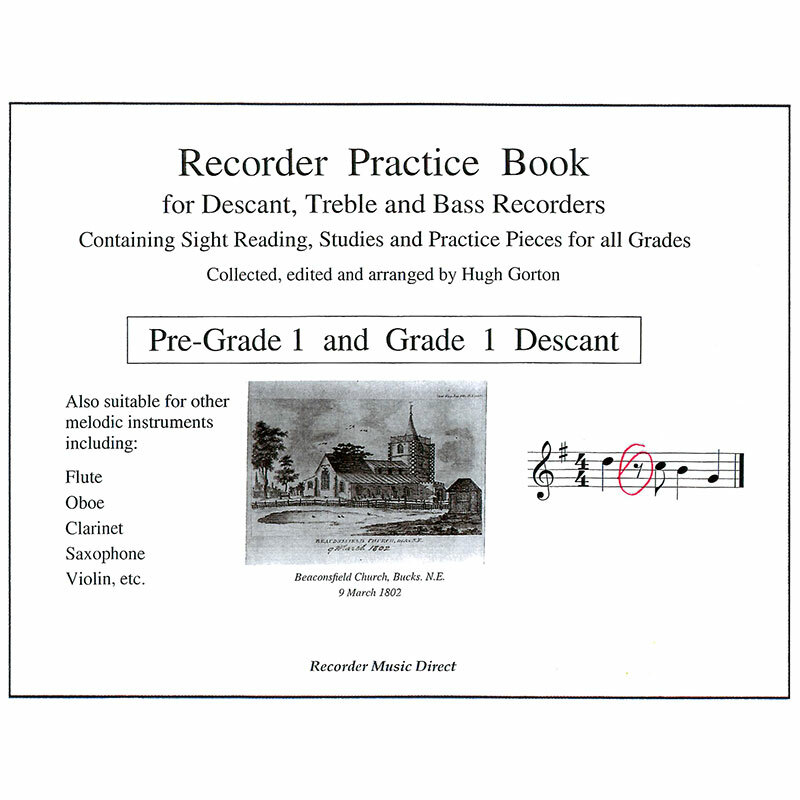 Grade 1 Treble shares the same book as Grade 1 Descant, Descant at one end of the book, Treble at the other. All the music for Treble is different from the music for Descant. The note range is Low G to High A (9 notes avoiding Low F). Middle F sharp, C sharp and D sharp are introduced. The note values and time signatures are as Grade 1 Descant The keys are F, C, and G major and D minor. Most of the pieces will be unknown to most students at this level but occasionally a familiar tune is added to check that the sight reading is going well. This can act as a confidence booster. Altogether there are 88 pieces of music in Grade 1 Treble. Sample pages from this book are shown above.